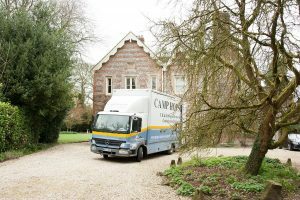 Do you need a removals company in Abingdon that knows the area well and can help take care of everything, including packing up and unpacking? Then you’ve found it in Camp Hopson. We’ve been going for seventy years and our expertise is the kind that can’t be acquired quickly. We’ve seen every moving problem there is, and as a result we know every solution. We’ll deal with hitches before they occur, so that you don’t even have to be aware of them. Moving always used to be a painful slog, leaving people too done in to enjoy their new homes. We’ve changed it, so that all the heavy lifting is done by us – you just have to show up, but no more than that. Other removal companies in Abingdon may promise the world, but we deliver it. Our fully-trained, BAR-certified (British Association of Removers) staff are swift-footed and quick-thinking, helping you to have a move that’s smoother than anything you hoped was possible. Every day, we’re moving people in and out of Abingdon, so we know the streets, the back-lanes, every nook and corner. We’ll get you from A to B quickly. As we move boxes and furniture out of your old home, we’ll take every precaution necessary to protect carpets, paintwork and banisters, and we’ll do the same at the destination. If you need storage in Abingdon, you’re not alone. Many people find that in the course of moving, they end up with excess goods and nowhere to put them. Sometimes, they’re downsizing, so there’s an even greater amount of unwanted belongings. Our storage facilities give you time and space to work out what to do. Whether you have long- or short-term requirements, we can help. We’ll carefully categorise everything you store with us, and give you an inventory. When it’s time to get your things back, we’ll arrange for them to be delivered to you. So…for seven decades of moving and storage experience, Camp Hopson cannot be bettered. Contact us today and we’ll send an estimator to discuss your move and draw up a quotation.